You’ve probably seen or heard about the benefits of wheatgrass. But one thing that you may wonder about this green colored drink is which form is better. Wheatgrass powder vs. juice form. As with many other drinks and supplements, wheatgrass comes in a variety of forms. Two of the most popular you’ll see are wheatgrass juice and the powder form in jars or tubs. For the most past, wheatgrass juice is found in juice bars or when they’re made fresh at home. Meanwhile, the more popular wheatgrass powder form is found in health and supplement stores. So which one do you take if you want to get the chlorophyll and protein that’s rich in amino acids from this grass. In this article, we explore each of the two methods of consuming this health drink. And tell you which method is better. There are multiple schools of thought that puts wheatgrass juice against wheatgrass powder. 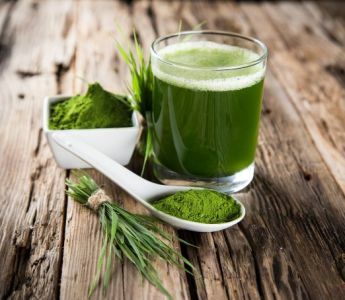 A number of experts strongly believe that consumption of wheatgrass just after juicing the young blades is highly beneficial for human health. This is why you’ll see wheatgrass preserved in a bed tray and made fresh only when you order them in a juice bar. It’s also the ready why it is a good idea to drink them immediately if you juice your own wheatgrass at home. This keeps the potency of the grass so you get all the vitamins and nutrients. Another set of alternative medical practitioners feel that the powdered variety is better. They believe that it offers more in terms of nutrition and benefits as it available in concentrated form. 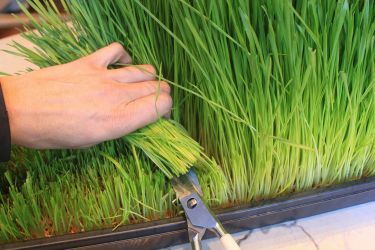 However, supporters and users of wheatgrass, who drink it for its healing and revitalizing effects, do not seem to care as much. They aren’t as concerned in which form it is consumed as long as some amount is incorporated in our daily lifestyle. As a backgrounder, we go back to explaining what wheatgrass juice is. Basically, wheatgrass juice is extracted from ground fresh grass from the wheat family, hence the name. It is valued by those who are into health and nutrition because this grass offers a multitude of vitamins and minerals. It contains vitamins A, C and E. And, is loaded with chlorophyll which gives it the vibrant green color. Wheatgrass also contains protein, calcium magnesium and iron. As a result, it helps boost our immune system’s ability to protect our bodies. This type of grass also helps our digestive system by eliminating harmful bacteria, among other things. Where to Get Wheatgrass Juice? This unique grass is purchased from natural food stores or grown in trays indoors. You can also buy them buy the shot (shot glass) in juice bars. One notable thing about wheatgrass is that this grass needs to be harvested at the perfect time. This would be within 10 days of planting, in order to make the juice. In its raw form, the wheatgrass is very tough to digest as it has a strong taste and high fiber content. Hence you’ll it is almost always mixed in with smoothies, tea or fruit juices to make it easily digestible. Though you’ll still see some people drink it straight up. The juice must be consumed very fresh as it has a tendency to deteriorate quickly and lose its potency. Thankfully, special wheatgrass juicers are available in the market that are used to extract juice from the fresh plants. Some higher end juicers also have the ability to do the same, though not all. One can easily buy wheatgrass powder from the local stores. They’re found in jars and tubs just as protein powder are. This makes them easier to purchase in bulk. Wheatgrass in its powder form comes from the dehydrated and dried grass. The powder can be packed into jars or packages, which is what’s sold on store shelves. They can be transformed into tablets that can be easily swallowed. Or, kept in their powder form, which allows you to scoop and mix in with drinks. There are many schools of thought which continues to debate whether wheatgrass juice is better than wheatgrass powder and vice versa. There is no denying that wheatgrass helps to build blood since the high percentage of chlorophyll mimics the blood hemoglobin. The only difference is that hemoglobin contains iron, and there is magnesium in chlorophyll. The very presence of chlorophyll ensures that wheatgrass can help to build red blood cells, dilate our blood vessels and improve the functioning of the enzyme system. Since wheatgrass has a high percentage of amino acid, it is much liked by bodybuilders. And they are among its users who try to incorporate powdered wheatgrass in the daily diet. Because it contains all the essential amino acids, wheatgrass is complete protein. This makes it a valuable source of high quality protein for building and repairing muscle, among other things. Our body’s immune system also gets a boost from wheatgrass which helps the body to fight various infections. You can either buy the freshly grown grass or simply buy a wheatgrass kit, grow and then harvest you own juice. There is also an option to buy organic wheatgrass supplements. Although both wheatgrass juice and powder have their own sets of pros and cons, it is to be noted that wheatgrass powder is often considered superior. This is due to the fact that it contains more in terms of nutritional value, at least when compared to wheatgrass juice which contains 95% water. 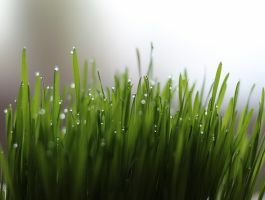 However, another set of experts claim that wheatgrass juice grown on trays can actually supply the body with more enzymes than the powdered wheatgrass. Though wheatgrass, either in powdered and juice form, have the capacity to cleanse the digestive system and help with weight loss. One thing you should consider is convenience. Wheatgrass powder is readily available. And after you buy it, it stores for a long while. Plus, you just need to take a scoop of the powder into your drink, mix and gulp down. Wheatgrass powder, while fresher, takes a bit more effort. There’s replenishing the grass every so often and keeping tabs of their freshness. When it’s time to drink, you’ll need to juice them as well. From what we’ve laid out, we hope you already know which type fits you. Either way, it can be easily inferred that both wheatgrass juice and powder have multitude benefits. 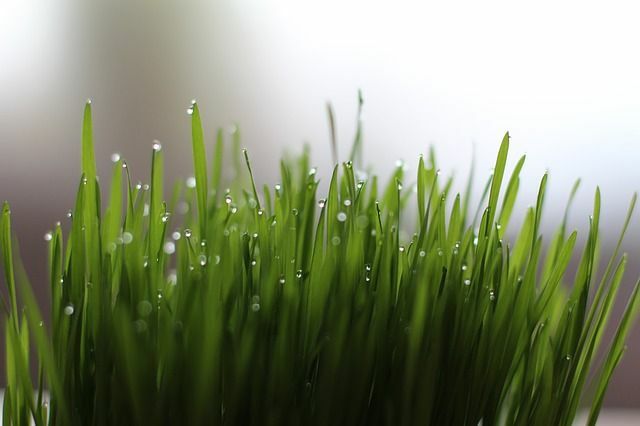 The concentration of enzymes, vitamins and proteins varies as it depends a lot on whether you are consuming wheatgrass juice made from freshly natural harvested grass or tray-grown grass. Or if you simply taking in wheatgrass powder. If you are busy then you might find it convenient to buy wheatgrass powder as it can be quickly mixed with water or fruit juices. And, it can be stored for a longer time compared to the wheatgrass juice. There is no scientific research to back the powder or the juice form. It simply depends on your choice and convenience.